V. Profundity of Influence: Chenghua Imperial Porcelain Imitated by Later Ages. Products of the two reigns might not be able to match those dated to the Yongle (1403-1424), Xuande (1426-1435), and Chenghua (1465-1487) reigns. 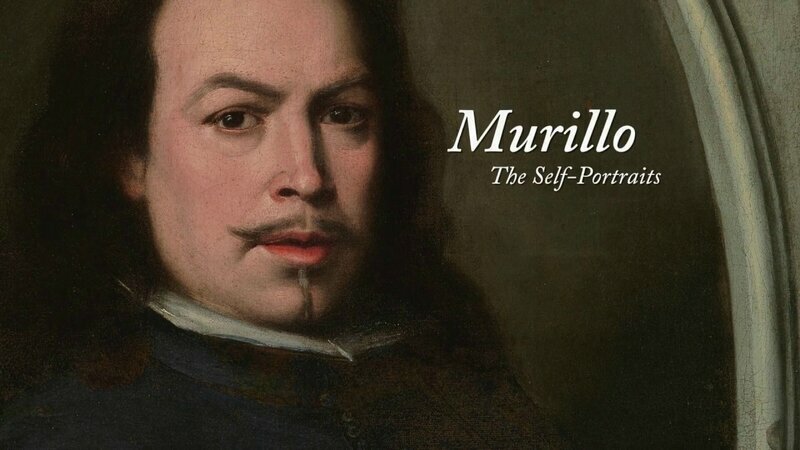 Yet, their quality is still fine, masterpieces abundant, some types highly distinctive in terms of style. 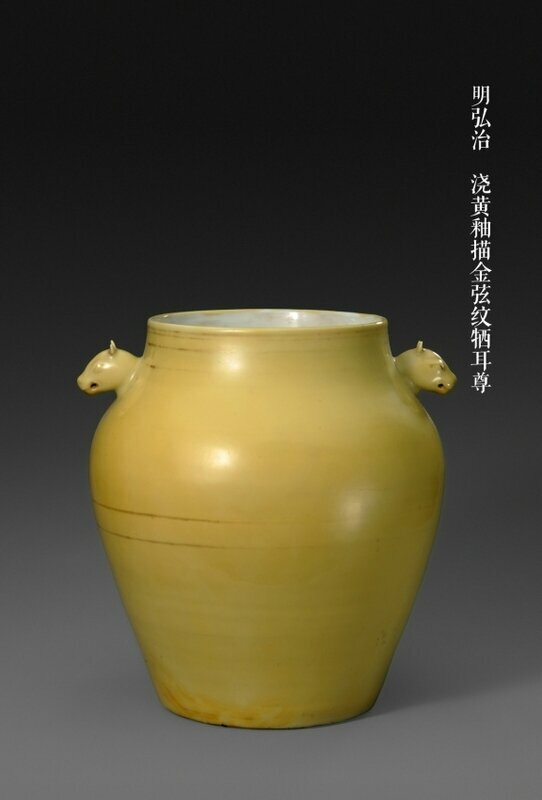 A yellow-glazed Zun in the period of Emperor Hongzhi. Photo Palace Museum. Stylistically, imperially-commissioned porcelain pieces of the Hongzhi reign carry on the legacies of the Chenghua reign, celebrated for its handsome form, refined body, smooth and subtle glaze, and sophisticated decoration. According to current figures, the imperial kiln in the Hongzhi reign produces approximately sixteen types of ceramic objects, only slightly over half of that of the Chenghua reign. Blue and white porcelain, objects with green glaze on white ground, and objects with bright yellow glaze win the highest acclaim. Especially the bright yellow glaze vessels, the fine and gentle smoothness reminds one of chicken fat, together with the delicate color and luster, winning such glaze the reputation as "delicate yellow". The Zhengde reign witnessed the turning point in the development of the Ming-dynasty imperial kiln at Jingdezhen, in that porcelain pieces of this period break away from the features such as light and thin body, limited shape, and sparse decoration. Porcelains of this period are marked by heavy and thick body, increasing variety of shapes, and the turn towards elaborate decorations. 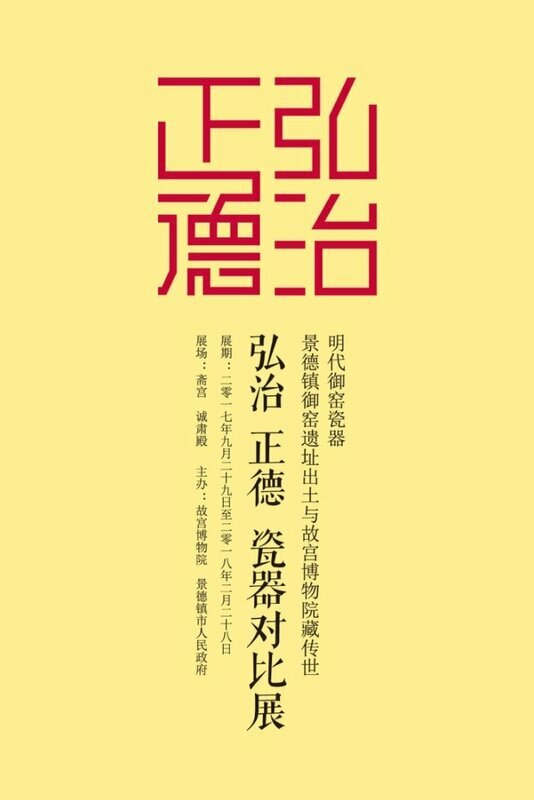 Over twenty types of objects were fired, less than those of the Chenghua period, but more than those of the Hongzhi reign. 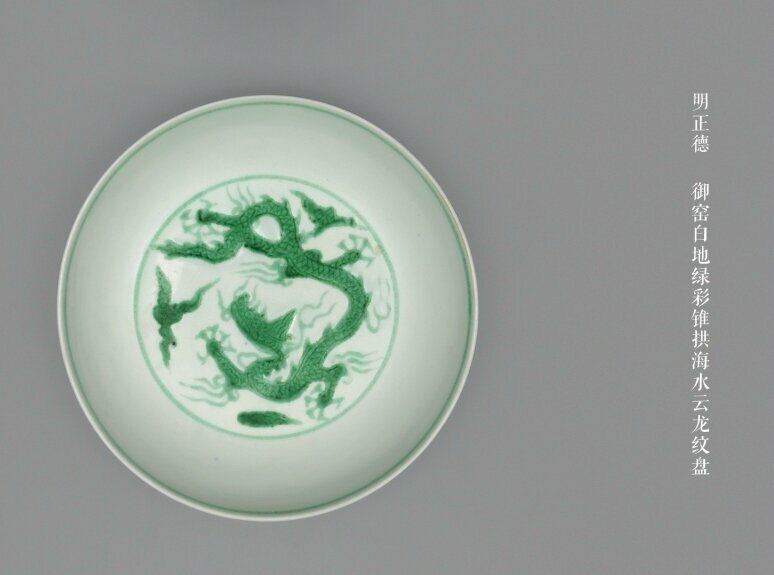 Objects with peacock green glaze from this period are the most accomplished, draw much attention, and can be regarded as masterpieces from the Ming imperial kiln. 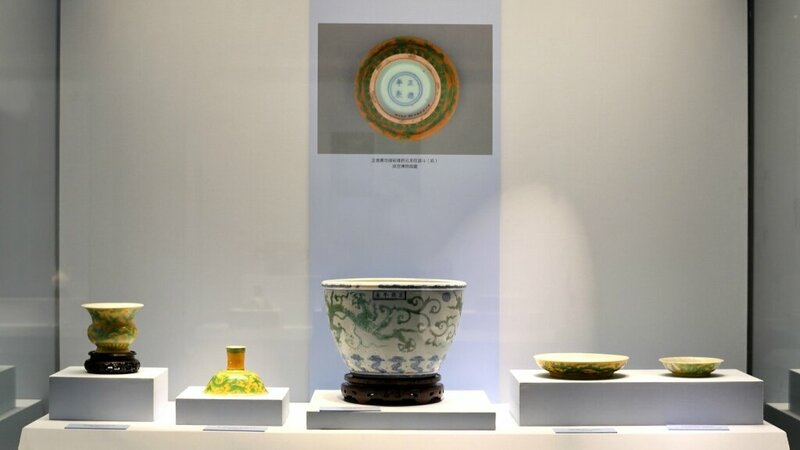 Large amount of Arabic and Persian texts are used as decoration, while, interestingly, reign mark written with the Phags-pa script is unique in the Ming-dynasty history of imperial porcelain products. This unique cultural symbolism seen on imperial porcelains of the Zhengde reign is heatedly debated by many scholars. 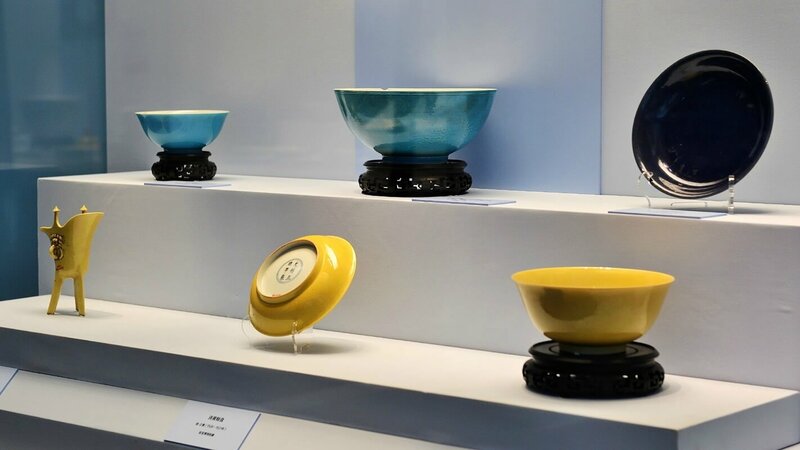 As time goes by, porcelains of the Hongzhi and Zhengde reigns have witnessed nearly five centuries of ups and downs. 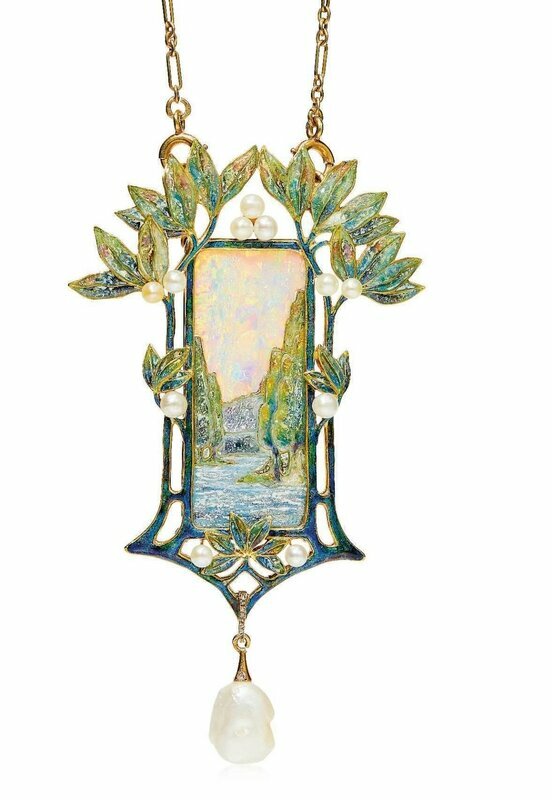 Still, this elegantly shaped masterpieces with fine and smooth body and sophisticated decoration still have the enchanting air that appeals to the viewer's senses. 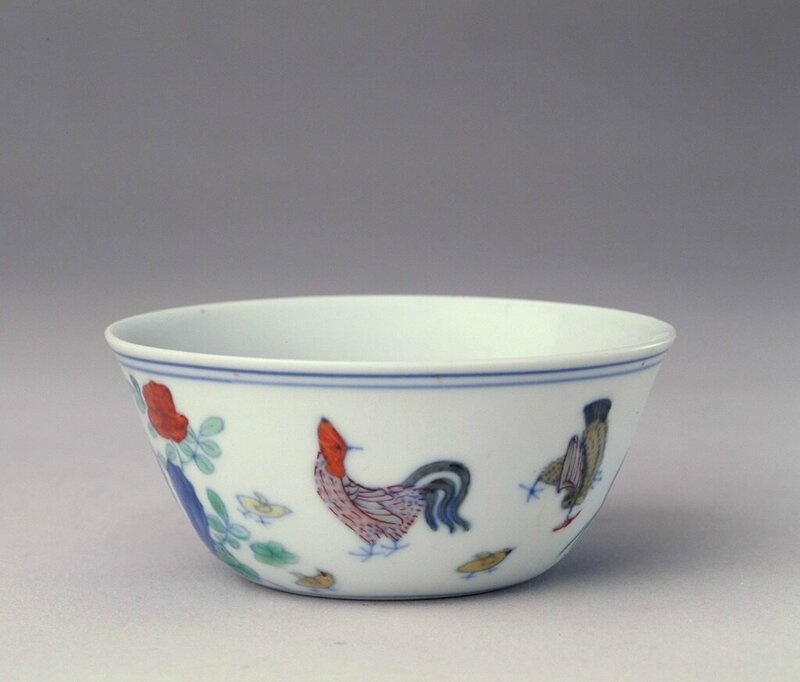 A chicken cup in the period of Emperor Chenghua. Photo Palace Museum. Exhibition views. Photo Palace Museum.